Firstly, children need exposure to many activities – to physically, emotionally, mentally get to try things out. You can read about any of these activities, but cycling through a woodland or baking a cake is a world apart from what words might say about it. No matter how good a description, it cannot give the experience. As our educational system is sometimes squewed towards sitting at desks and learning, and as our children tend to spend more and more time in front of screens reading or gaming with limited body interaction, we can often forget how important it is to have a full body experience and DO SOMETHING – experience it. Taste, feel, see, listen, touch, and learn from the doing. Secondly, most of experiential learning is fun because you are doing it with others (making new friends or learning something new with old friends) most importantly, because you let your child choose the activity (yes, you can encourage them to take up football because you play, but don’t force it). Simply encourage them to choose something they are interested in enough to give it a try. Most of all you are encouraging them to have FUN, learn through JOY and laughter. Of course there are often tears as well (see the list of failures below) but the getting back in the proverbial saddle will give them resilience, perseverance and a grand sense of achievement when they finally master the activity. Thirdly, the key thing about experiential learning activities for kids is that they need practice if they are going to succeed. And they need to learn about failure and what a great teacher it can be. Read any management book these days and they will talk about the ability to learn from failure. Tolerating failure is such an important life skill and all experiential learning activities give this opportunity. How great it is to fall off, mess up, ruin, make a mistake, burn and fail. Because each mistake is a learning. Each failure requires courage to continue on or start again. Experiential learning takes practice. Practicing failure. So here’s a list of ideas (and links) that might give you a few ideas of things to try as experiential learning activities for your children this summer. There are many, many activities for children these days – and we are lucky to have the internet to be able to search for them in our local area very easily. Please note most of these activities are for the 8+ age group if you want things for younger kids there are plenty of activities available, and most of them will be shorter and for the very wee ones will include your presence too. Children going away to summer camp is a common activity in the USA where the long long summers make it a practical solution for working parents. 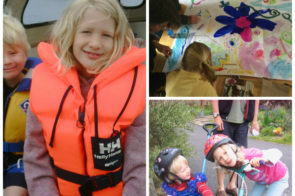 In the UK, PGL have Active adventure holidays for kids… although sometimes children often refer to PGL as ‘Parents Get Lost’, the company actually takes its name from the man who started it all in the 1950s – Peter Gordon Lawrence. He started with canoe trips and it all grew from there. UK based, but with holidays available all over the UK plus in France and Spain. They have a great outdoors, activity based ethos. Just what you need for getting your kids active, or for channelling all their excess energy into learning a new skill. Whether your child takes up rock climbing, sailing or hiking as a life long passion or not. Remember experiential learning is about getting them away from the more usual way of learning by sitting down at a desk, it’s learning that requires a body and a mind (not just an intellect). And so opens the door for many other kinds of learning. My family and I are lucky to have Wild Things! is a local environmental educational charity based in the North East of Scotland, right on our doorstep. My children have enjoyed the fun of outdoors through learning bushcraft skills, going camping and attending nature days. Obviously if you are not in Findhorn, you need to look for your local equivalent (although WildThings! do have camping trips if you are prepared to travel). It’s always great to find and support a local charity (google bushcraft, or nature activities for kids) or ask around to find out what can be discovered in your area. Wild Things! are brilliant in bringing nature and nature activities alive for children, they have incredibly creative and enthusiastic instructors and make a day or a camping trip so much fun. If you’ve read my blog post about your child’s imagination you know how much I see the importance of time in nature and how I believe it helps children develop lifelong creative thinking skills. I liked the look of the St. Ives School of Painting Cornwall and found it in my own internet search. It is one example of many places that offer craft workshops, painting days and other ways for children to get creative, in a studio and to be happy. There’s a massive directory of events, workshops, courses listed in the Summer Camp directory. The main thing to consider about giving your child experiential learning is that they may have to just try it to know it’s not for them. Think of your own childhood. Did you play scoccer, join the drama club, play an instrument or attend a dance class? Chances are you had a go at a few different things. Worth giving them a try. Many adults I know who have a passion, hobby or vocation started it in childhood. Sailing RYA approved centres are around the UK and tennis camps galore, swimming holidays to get them really going with their strokes. The MOST important aspect is that it is FUN! There is nothing worse than picking up a child from a day activity who looks miserable and didn’t enjoy it at all. Of course there will be down days, there can be bad weather, they don’t get on with the instructor, or it just wasn’t their cup of tea. No matter, if they are overall in an upbeat manner when talking about it then it’s been a great learning experience. Cooking Classes are becoming more and more geared towards kids. Many people are starting to see how important it is for children to learn this vital skill. But not just how to make cup-cakes! (although it’s true the promise of sugar will often motivate them to get in the kitchen). You want your children to be healthy and a good diet and excellent eating habits will ensure they are healthy and ultimately live a long life. Governments are realising the lack of learning good nutrition from an early age could mean a life of ill-heath, poor eating habits and risk of chronic disease. Healthy eating is being introduced in schools and I believe that cooking and GARDENING (so you can grow, pick and then cook your own vegetables) is a terrific was to engage children to health eat. Computing Workshops and camps Many parents want to get their children away from screens and it may well be a crazy thing to say consider the experiential learning environment of a computer workshop. But your child – if computers genuinely are their passion – may just be miserable if you try them in a canoe, they might hate you forever if you send them on a drama course, and they might refuse to speak to you for a month if you make them go on an adventure holiday. But if you research it carefully you might find a fun, experiential, learning workshop all about computers. They might learn how to put a computer together. Learn some vital programming skills. Build a Kano computer (build with a raspberry PI inside). Kano – the manufacturers of the kits – say an 8 year old can build one. See what computer workshops might be available and all will be forgiven from your long suffering child who gets seasick at the sight of a rowboat. If you read a bit more of my blog you will know how much I emphasise getting children Seeing Nature with the Royal Society for Protection of Birds (RSPB) and you can use any wildlife charity, like the John Muir Trust, to find out about events and conservation weeks near you. Having a focus like bird watching or fishing can engage the children to have a reason to be in nature. They might not yet be in a Zen like state of wanting to empty their minds and let nature be the place to do that. So find the activity in nature they love and go do it ! I hope this article is useful for you, and if you have any further ideas for experiential learning activities for kids then head over the the Joyful Parents Facebook page and put a comment there. And if you are struggling to get your child off the computer, maybe they don’t have a passion or a hobby, I’m happy to offer you a mini-coaching session to look at what the underlying issues in your family maybe. Simply fill in the contact me page. Or you may want to look at an alternative route for a deeper connection with your child and order a Child Soul Card Reading click the link for more details.